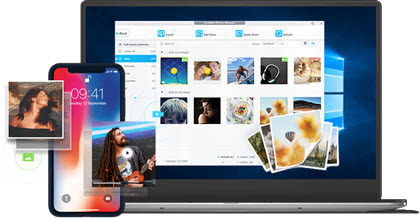 Solved| How to Delete Photos from My Mac on iPhone? How to delete pictures From My Mac album on iPhone when there's no delete option? "Why can't I delete some photos from my iphone? Some photos just do not include a trash bin at the bottom of the page." It's not hard to notice that those photos are saved under the same iPhone album called From My Mac/From My Computer. The fact is, these pictures are undeletable directly from iOS devices because these photos are imported from computers/Macs. To delete these synced/imported photos, here below is what you need to know. ✔Select and delete photos from My Computer album. a. Why can't we delete certain albums and photos? To delete from My Mac Album on iPhone or delete photos from My Computer album, you should understand that photos saved in these albums are imported/synced from your Mac/Computers, through iTunes library or via other third-party transfer software. And directly deleting photos from iPhone that were synced from computer is impossible! This is a defect of iTunes syncing utility as it always tends to create a mirrored version of photo library on your iPhone without mixing it up with iCloud photos, and in prevention of users miss deleting photos, they decide to only allow you to delete those imported photos from their original place - Mac/Computer. b. How to Delete Undeletable Photos/Albums from iPhone. There are basically two ways to delete photos from My Mac album on iPhone - without iTunes and using iTunes. By using iCloud, you can delete photos from my Mac album entirely on iPhone without computers. Note that you cannot choose which photo you would like to delete. By choosing Remove from iPhone or Download iCloud Photo & videos, you can disable iCloud Photos right away. 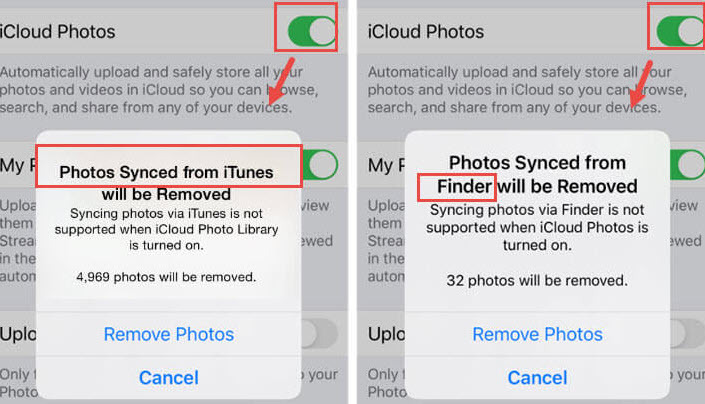 An alert will pop up reminding you that photos synced from iTunes will be removed. This not only means that pictures imported from iTunes, but all those manually synced iPhone photos will be removed entirely. Rest assured that those photos are 100% in your From My Mac/From My Computer library. Step 3. Click "Remove Photos"
Step 1. After launching DearMob iPhone Manager, click on "Photo Transfer"
Step 3. Click "Select All" and click "Delete Photo"
Step 4. Click "Sync" button on the right corner, then all those undeletable photos will be deleted right away easily. 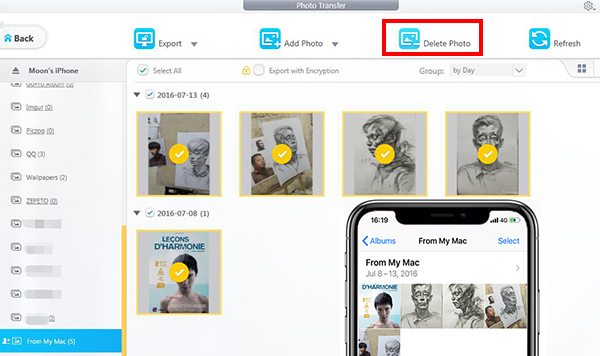 The best part is that DearMob iPhone Manager allows you to select and remove certain photos From My Mac/From My Computer on iPhone instead of removing all of them as a whole. You hold the key to the existance of each photo synced to iPhone. You can choose to delete one or several photos as you prefer. To remove photos marked "from My Mac"/from My Computer" on iPhone using iTunes, there are basically two ways. 1. Stop syncing all iTunes photos/albums: Connect the iPhone to to the computer, select the iPhone as you would to sync any other content. Go to the photos tab, unselect any photo folders that you do not wish to have on the phone, click on Apply or Sync. That will remove them. 2. Sync with an empty photo album: Create a new empty album and select that empty folder to sync photos from and it should clear it out. But the limitation is, you cannot select individual pictures from iTunes to remove, you can only remove an entire album from the list in iTunes. 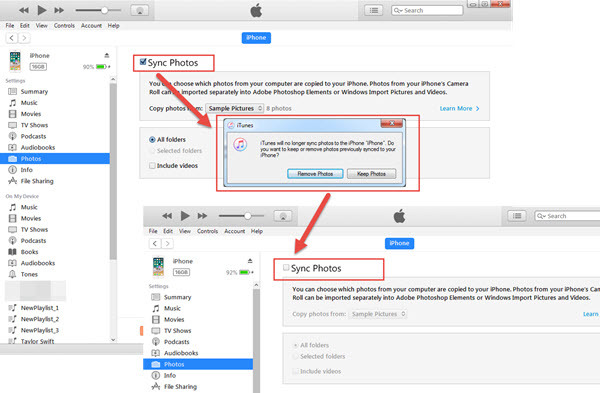 How to Solve iTunes Won't Sync Photos to iPhone/iPad? DearMob iPhone Manager is a Windows based software which cannot be downloaded directly to your Mobile phone. Please input your email below to receive the download link and the license key to active on your PC. ● Your data and info won't be compromised. DearMob iPhone Manager is a macOS based software which cannot be downloaded directly to your Mobile phone. Please input your email below to receive the download link and the license key to active on your Mac.